This is a well made classy personalized Christmas stocking, constructed of Christmas velvet on the body which is further enhanced by very pretty ribbon and snowflake applique. Names can be personalized on the cuff of this Christmas stocking with metallic embroidery threads to complement the stocking design and color scheme. 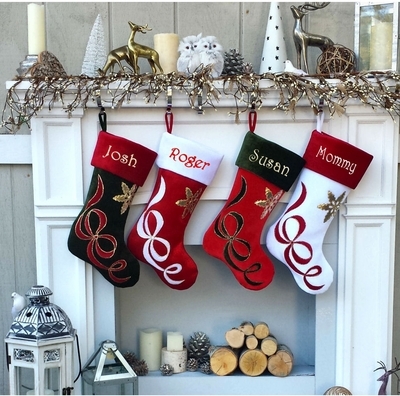 We have a sample picture of the stocking monogrammed with gold metallic embroidery thread ... click on the thumbnail image in the top right hand corner of this page to see a larger version also feel free to preview the video and additional images of this best selling stocking.